March Week Three continued » What's Under the Needle? Now it's my turn to show you what I did. It's so different than Emma's! 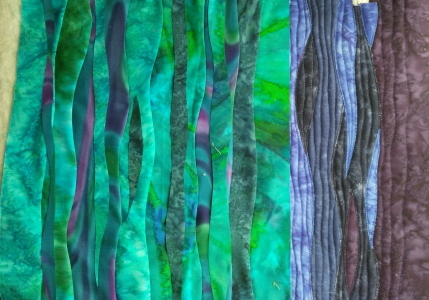 I started with the curved piecing and the ocean - two of my words. 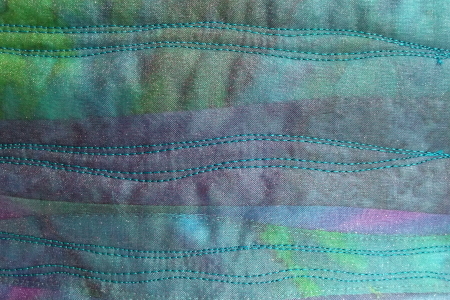 I layered the strips of fabric in the order I wanted them and overlapped them about 1"
and after pinning the ends and middles together, sewed each seam using less than a 1/4" seam. Using a smaller seam means I less likely need to nip and trim the seam allowance. I pressed each seam as I worked. 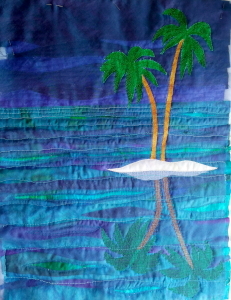 As I was doing this, I noticed a sample of some applique I'd done for one of my workshops and it happened to be the right colors for my night sky so decided to use that rather than to create a new one. The pieces were raw edges and stitched through batting and backing. 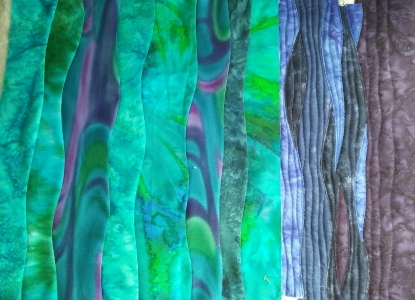 There are some extra quilting lines but that's okay. 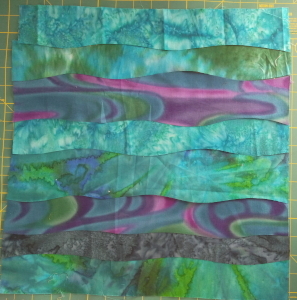 I added my ocean to it and extended the backing fabric to fit as that was a bit short on the original piece. 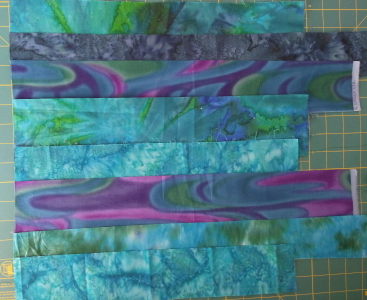 I thought I might use the remnants left from the cut curved strips over the top of the ocean to bring the two sections together better. I lay the remnants on top and found this broke up the big sections creating more movement in the ocean. 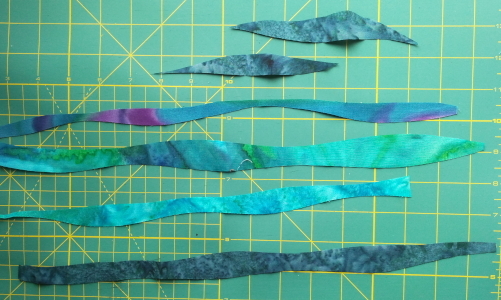 Once the pieces were to my liking, I stitched them down with free-motion and some of the threads I'd collected last week. For some reason, at this point, I had this strong urge to cut this up in some way. 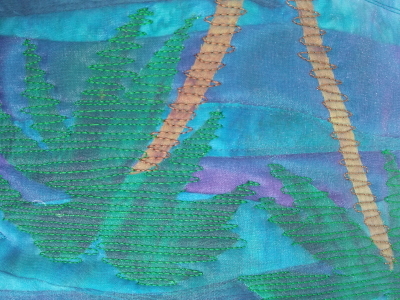 Instead, I thought it might be better to use a sheer fabric over the top to create additional layers. I figured this would help create my reflection too and make the ocean simmer. I discovered it also darkened the sky which made it perfect for my night sky. 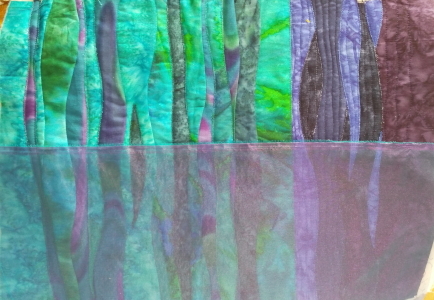 I liked what I was seeing so continued on by stitching on top of the sheer, horizontally over the reflections extending the stitches over the raw edges to soften them and make them appear as if they were moving in the water. The island and trees I stitched only on top of the actual shapes to keep them crisp and sharp. 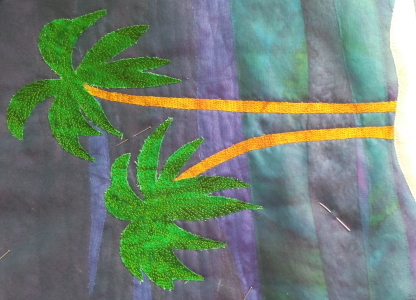 I gave the palm leaves shape by stitching out from their centers. I'm really liking how it is coming together but not finished yet! 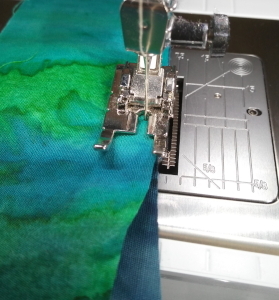 Then using sharp pointed scissors, trim away the sheer fabric within the stitched area. 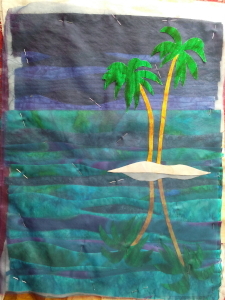 I also added some lighter thread to make the ocean shimmer even more. 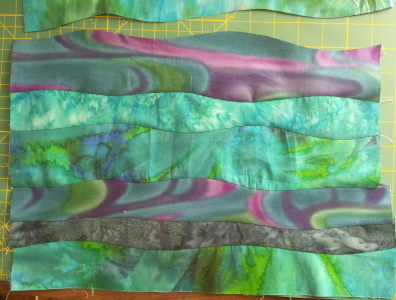 With the quilting underneath the sheer fabric in the sky section, I haven't decided whether to do more or not. I'll think on that next week when I finish up and add some beads. I am quite pleased as to how it is looking so far so perhaps fireworks is all that is needed now.